Nonfat Greek yogurt and fruit, topped with crunchy granola. plain nonfat greek yogurt (cultured grade a nonfat milk [contains active yogurt cultures]), strawberries (strawberries, sugar, modified corn starch, cellulose gum), oat and honey granola (whole rolled oats, milled cane sugar, rice flour, oat flour, vegetable oil [canola and/or safflower and/or sunflower oil], molasses, honey, natural flavor, salt, barley malt syrup), blueberries. 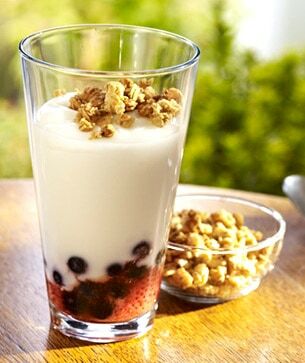 The delicious tang of Greek yogurt meets real strawberries and blueberries, and crunchy granola. It's a simple and delicious way to kick-start your morning.